While you might not think of chocolate milk as your healthiest beverage option, it has a place in a balanced diet. Drinking chocolate milk after your workouts might offer benefits, as Dr. John Ivy, Ph.D., explains in an interview with the University of Texas, that drinking chocolate milk as a post-workout snack helps you hold onto muscle and burn fat. Chocolate milk also offers other health benefits, thanks to its nutrient content, but drink it in moderation, because it contains added sugar. Each cup of chocolate milk boosts your energy intake by 190 calories, and provides roughly 10 percent of your daily caloric intake in a 2,000-calorie diet. Most of chocolate milk's calories come from its 4.8 grams of fat and 30 grams of carbohydrates, which provide energy to help you get through the day. Chocolate milk also offers 7.5 grams of protein per serving. This protein helps your body maintain and repair muscle tissue, and it also supports hormone and enzyme production. Getting enough protein in your diet also nourishes other tissues, including your eyes and skin. The minerals found in chocolate milk nourish your skeleton. Each serving of chocolate milk provides 272 milligrams of calcium, or 27 percent of the recommended daily intake. Calcium becomes incorporated into the mineral tissue that makes up your bones, and a calcium-rich diet fights bone-related diseases, such as osteoporosis. 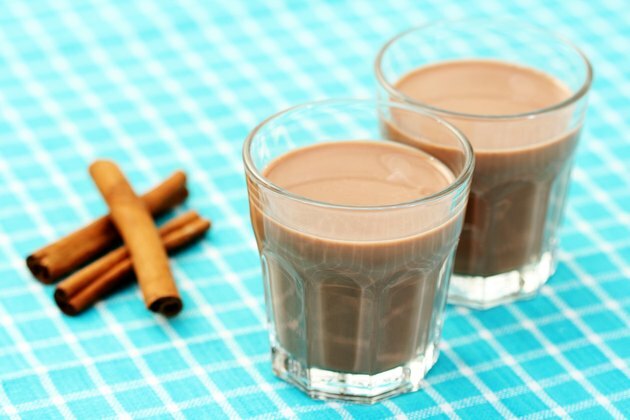 The copper found in chocolate milk helps you make collagen, a protein found in abundance in bone tissue. Drinking a cup of chocolate milk boosts your copper intake by 188 micrograms, or 21 percent of the recommended daily intake. Drink chocolate milk and you'll also consume more vitamin D and riboflavin, which is also called vitamin B-2. Vitamin D supports skeletal health, because it helps your body absorb and use calcium. It also benefits your cardiovascular health by controlling your blood pressure, helping to keep it in a healthy range. A serving of chocolate milk offers 122 international units of vitamin D, or 20 percent of the recommended daily intake. The riboflavin found in chocolate milk helps you metabolize nutrients and produce energy, and it also helps your liver detoxify your body. A serving of chocolate milk boasts 0.46 milligram of riboflavin, which is 42 percent and 35 percent of the recommended daily intake for women and men, respectively. Drink chocolate milk in moderation to maintain your health; each serving contains 4 teaspoons of added sugar, which is two-thirds of the recommended daily added sugar limit for women and 44 percent for men, according to guidelines published by the Harvard School of Public Health. If you drink several servings of chocolate milk daily, you'll easily exceed your added sugar allotment, even discounting the added sugar in other foods in your diet. Drinks sweetened with sugar contribute to obesity, and can also be bad for your health, increasing your risk of diabetes. Is Chocolate Milk a Healthy Choice?